The poster for the second Fiction Fiesta is ready. Fiction Fiesta is an intimate but international festival, specializing in fiction and poetry in translation. The plan is to team novelists and poets from Latin America with writers from Wales and the rest of Great Britain and Ireland: the writers will read and discuss their work and answer questions from the public. Fiction Fiesta will provide a forum for all people with an interest in international literature, from professional translators to the merely curious. 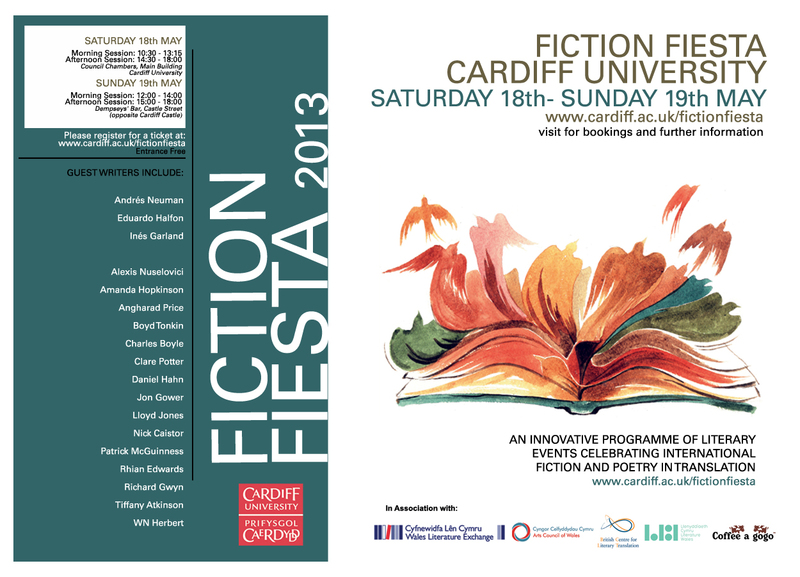 Fiction Fiesta is a festival with a difference, involving readings and discussion that will bring the public into contact with some of the best writers from around the world, in a friendly and informal setting. The event is free, but each year we will be inviting guests to donate to our chosen charity: this year we will be supporting the work of Education for the Children in Guatemala. The 2013 festival takes place over two locations: the Council Chamber in Cardiff University’s Main Building on Saturday 18th and Dempseys’ Bar, opposite Cardiff Castle on Sunday 19th May. Our guest writers and translators are listed in the poster above (squint or zoom) and include our Latin American guest Andrés Neuman (author of Traveller of the Century – shortlisted for The Independent foreign fiction prize this year), Eduardo Halfon (author of The Polish Boxer) and Inés Garland (author of Una Reina Perfecta). Both Andrés and Inés are featured in the forthcoming 100th issue of New Welsh Review, while Eduardo’s Polish Boxer is my favourite new fiction collection of the past twelve months. You can find out more on the Fiction Fiesta Facebook page.